Welcome to my first set of Calendar tabs and printables! I'm so excited about this. It was so fun to make, I loved using my artwork for something useful, and I get to share it with you guys. All things that I love. This was something that I'd had on my mind for a while. While bible journaling and using my planner, I noticed that there are a lot of fellow Christians out there that are making fun calendar and printable stuff. But my frustration came in looking at the specifics of our Catholic faith. I love a lot of what I see out there but I wanted to add in more specifics to the Liturgical calendar, feast days, saints, and the like. That said, it's my first go at this so I hope you'll be understanding of the imperfections. 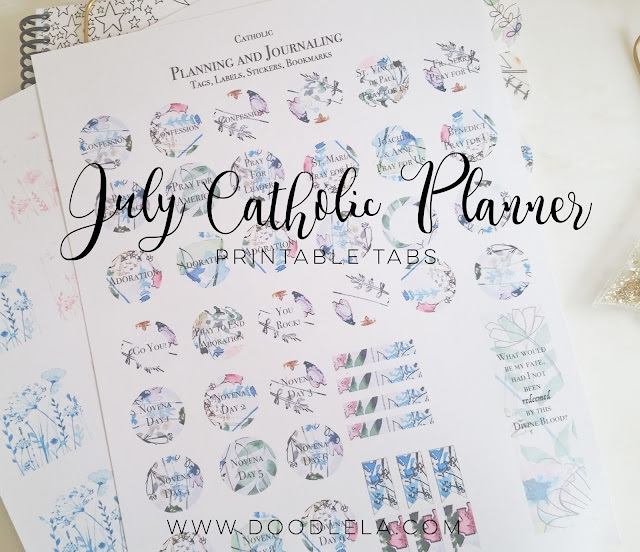 I am working specifically with Catholic Sistas Day Planner while I'm planning out my tabs and such, so they are specific to the calendar day-square size found within the planner. In the future I'd like to make it more adaptable to other planners to make it work for more people. I have a list of ideas that I'm working on for next months tabs, some small tweaks and size changes. Over time I think that they'll get better and better. And I'm hoping for your input, so bring me your ideas guys and leave me some comments with what you think would be fun to add in for the future! Grabs your copies for July at the links below!